Hi, I’m looking for a good method of changing the clothings of my character. 1. I’m a bit confused. Whose method is better? Naotaro’s or the tutorial? Is Naotaro’s method more convenient because I no need to create multiple moc files for the costumes? 2. In Naotaro’s method, I tried to export a moc file with all different clothings displayed. But when I dragged the moc file into the Viewer, I found out that I am unable to switch the clothings/ texture. It seems the Viewer can only switch the arms but it is unable to switch clothings? 1- the tutorial method: it assumes you are just starting out with live2d and gives you the easier way, also because the free version doesn't support more than 1 texture for the character. so it advises you to create two model (cmox) files and switch between them. this way you only need to change the PSD for the clothes to be changed, and save them as clothes1.cmox and clothes2.cmox and you're done. if so, you need to create a parameter of showing or hiding the different articles. you do it by highlighting the clothes set #1 and #2, and creating a new parameter with two points. now choose only the parts of set#1 and make their opacity at 0% on the left end of the slider, and 100% on the right end. then choose only parts of set #2 and make their opacity opposite, so it's at 100% on the left and 0% on the right. this way when you slide the parameter from one end to the other you will get a fade effect that changes the clothes. Thank you for comment renoa . I'm apologize for confuse you . To use multiple texture files, you must have Cubism Modeler Pro . I think that renoa method is Good ! Thanks for your replies, Renoa & Naotaro I'm using Cubism Modeler Pro (Trial). May I know is there a limit to the number of clothings that I can have for 1 character within 1 cmox or moc file? If i have like 10 clothings.. I just need to show 1 clothing and hide the other 9 clothings, right? Also, I tried to export a moc file (with 2 different clothings displayed). But when I dragged the moc file into the Viewer, I found out that I am unable to switch the clothings/ texture. It seems the Viewer can only switch the arms but it is unable to switch clothings? And lastly, will it be inconvenient for me if, later on, I decided to add 1 more clothing for my character? Do i need to go back to the cmox file to add in 1 more clothing (to the other 10 old clothings) and generate a new moc and etc? Or do i create a new cmox file with that new clothing? Any idea? if you're planning to buy a PRO license, you can add any number of clothes to one cmox, but if you plan to keep using the free version for a while, i suggest you go with one clothes per cmox. 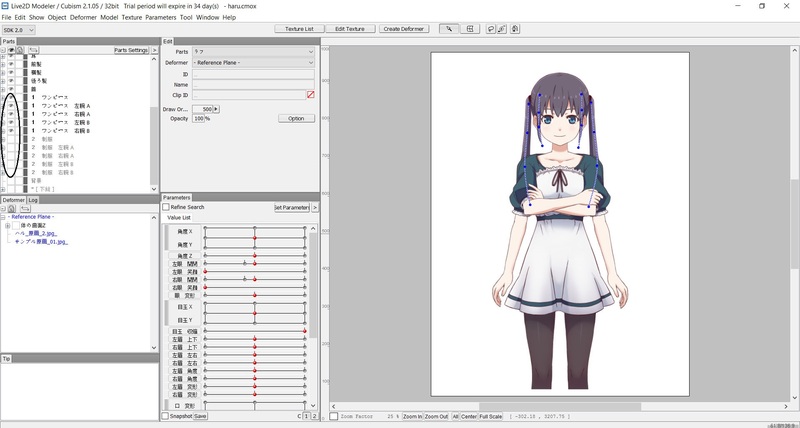 to be honest even if i have the pro version, i'd go with one set of clothes per cmox file. that way there's less room for learner's mistakes on my end, and there won't be a possibility of texture display problems in whatever SDK i might use with my model in the future. also this makes it easier for you to share your work with any team mates, since everyone can open the file with the free version to help you with your game or app, but it's expensive to expect everyone to buy the pro version just for one project. very few commissioners or freelancers would do that, or they will expect you to buy the program for them. if you're undecided on which method to go with, i suggest the one-set per cmox ^^ if you try it and don't like it, you can always import the textures into one of the cmox and delete all the others! Hi Renoa, if I use your 'one set of clothes per cmox file' method, how do i switch the clothings in Unity? My method will change in programming . You can easily change two of clothes . Certainly my method will not be able to check in Live2D Viewer. "two of the clothes of deformers shape must be the same"
For example, my character's right arms for the 2 clothings, do they have the same 'deformers shape'? I think what naotaro means is that for his texture switching technique to work the shape of the clothes, i.e. their polygons, need to match each other exactly. It won't work if you have a long dress and a short dress, etc.. So his technique won't work for clothes with different shapes as you seem to be using. renoa's approach works good in the modeler and animator but implies overhead when used with the sdk especially when having more than 2 pieces. If I have long dress and short dress, different shapes etc for my character, what method should I use to switch clothings? The best way then would be to put your complete character with all its clothing into one .cmox file, but export several .moc files for each variation you need. You could change clothes by loading the corresponding models. As long as you don't have to switch clothes often, i.e. multiple times a second, this could be pretty performant. You can control which parts are exported by hiding the parts you don't want to get exported. I hope this explanation somehow makes sense. Thanks for your reply, Andi. Please refer to the attachment. Can I hide the clothes by unclicking the eyes, as shown in the attachment? Previously Renoa mentioned that I can also hide the clothes by creating parameters for the clothings, and then adjust the parameters to hide them. Any difference in these 2 methods? Either method, the moc files generated will still be the same right, and also produce the same result in Unity? Right, you can hide and unhide stuff like . No, the generated moc files wouldn't be the same. If you go with renoa's approach which is great if you haven't got that many variations, you export one moc file with all the parts visible and the moc will include all parts. You then load that one moc file as one model in Unity and make your clothing visible by setting the corresponding parameter with Live2DModelUnity.setParamFloat(). What I described would result in something different: For each clothing variation you make all the parts that are necessary for the variation (including "common" parts like the eyes, etc.) visible and hide all the others. Then you export a moc. You then redo the process for as many variations as necessary. You don't need a parameter to change the clothing and the moc files will only include the parts that were visible when you exported it. In Unity you then load the model from the moc file that matches the clothing you want. If you want to change the clothing, you load a new model from the corresponding moc file and throw the previous one out. (Or you load all models and keep them in memory). As you export all your moc files from a single cmox file, all moc files will have the same parameters so they can share animations, and so on. Sorry, a rather long answer but I hope it cleared things up a bit. Hi Andi, thanks for your reply again. "The best way then would be to put your complete character with all its clothing into one .cmox file, but export several .moc files for each variation you need." Can I have one character with just one clothing per cmox file? If i have 3 clothings, then it is 3 cmox files => export as 3 moc files. I'm saying this because my current files are already 'one clothing per cmox file' If i export them as moc files, there shouldn't be a problem using them to switch clothings in Unity, right? Or are there any disadvantages as compare to your method? Of course you can also have 1 cmox file per clothing. Hello,first of all sorry if my question is out of the topic... well i just started using live2d (paid version) and i'm going to make a dress up game with this software, so there would be so much clothes, accecories, hair etc i should made. Now i'm stuck in this problem, is switching asset/ clothes. So here is my questions. 1 Do i have to set the deform and parameter for "every" alternative clothes, hairs and accecories? 2 do i have to draw all the other clothes, hairs and accecories on the same psd file as the basic model? 3 and what if i want to add more clothes hair and accecories after i'm done with the first model? I mean how i do that? 4 i'm always restart my work everytime i found a mistakes on my texture, is there any shortcut to change some part of your model? So i dont need to deforming and set the parameter all over again? Of you could kind enough to show me the way towards any tutorial about it, will be really appreciate. 1) You don't necessarily have to, but depending on the clothing, it's better to so. 2) You don't have to put everything in the same psd. But if you decide to put everything in one psd, make sure that you don't get conflicting layer names. 3) Just add a new layer to a psd and (re-)import it, and work the parts in. You don't have to start over from scratch. 4) You can just fix the mistake in the psd in reimport it afterwards. Then you basically just have to rework the parts you fixed.